During my marathon blog reading session, courtesy of Mr. Bittman, I wandered over to A Lusty Bit of Nourishment. How’s that for a great name? A few clicks later, I was introduced to Cocoa & Chile Pork Tenderloin. As I’ve said before, I love, love, love, the combination of chocolate and spice. So it was only a matter of time before I pulled a tenderloin out of the freezer and gave this a go. Pork is one of those things that intimidates me. Whether its bad memories of pork from the past, or my obsessive compulsive worrying that it’s going to be undercooked and make everyone sick, I get a little uneasy when I see it on an ingredient list. Unlike a nice marbled piece of beef, pork is extremely lean. So it needs two things: a lot of added flavor and quick cooking. Under seasoned pork tastes pretty bland. Over cooked pork is D.R.Y. And the two together is a waste of good money. So I guess the lesson here is to go big and bold with flavors and rely on an instant read thermometer to keep an otherwise tasty dish from becoming shoe leather. This recipe calls for two pork tenderloins. Until I opened the package, I didn’t understand that there were actually two small tenderloins pressed together in one package. I’m pretty glad I didn’t defrost the second package of tenderloin that I picked up at Costco. Although, having more leftovers to nibble on wouldn’t be such a bad thing. In a small bowl, mix together the brown sugar, cocoa powder, chili powder. Add olive oil in a slow drizzle and stir until you have a thick paste. Smear the paste all over both tenderloins until they are completely covered (this will be a bit messy, just so you know). Heat a large oven proof pan over medium high heat, add a small amount of olive oil, and brown the tenderloins on all sides. Transfer the pan to the oven and cook until the roast reaches 135 degrees on an instant read thermometer (this took less than 30 minutes in my oven). Carefully remove the hot pan from the oven, transfer tenderloins to cutting board, and cover loosely with foil to rest. Place (the still hot) pan over a medium high flame. Add white wine or chicken broth to the pan and stir up the bits of fond from the bottom of the pan. Cook until the sauce is reduced by half. Remove from the heat and add a small pat of butter and any juices from the cutting board to the pan. Whisk until butter melts and taste for seasoning. Slice the tenderloin into medallions and serve with sauce spooned over each serving. Overcooked pork is certainly dry, but I find that for some strange reason, despite its leanness, pork tenderloin is pretty forgiving. I’ve undercooked it and overcooked it and both ways it comes out edible. I like the idea of chocolate and spice together too. I planned on making some pulled pork this weekend, but may switch the bbq to a chocolate-based sauce instead. Kathy, my record with pork is spotty but this recipe has not failed me yet. The chocolate and spices compliment each other so well that I can’t say enough good things about them. Let me know how this works for you if you decide to give it a try. 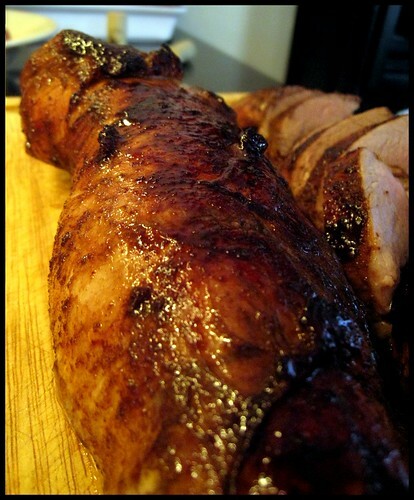 I love pork tenderloin! This recipe looks like it has a lot of flavor–must try!! The Mistah loves it when I make this because it has so much flavor…and heat. I’m not usually a spicy girl but I make an exception for this. I’m cooking more pork tenderloin tonight! Nice sounding recipe and that glaze looks amaaaaazing. A sauce can do a world of good for pork tenderloin. I think Ned’s decision to throw a tasty sauce together for your Real Simple pork was a winner. My dad is a big fan of those premarinated pork loins that come in the baggie from Costco. I actually think that’s the only way I’ve ever had pork loin prepared. Perhaps I should try this for this week’s Sunday dinner to feed the usual suspects. Beth, I’ve never tried the preseasoned ones. How do you like them? This would be awesome paired with some brussel sprout hash or mashed potatoes for Sunday dinner. If you make it, please let me know how it goes over with The Usual Suspects. In my taste the preseasoned ones are too salty. The taste is okay when you’re eating it, but two hours later you want a gallon of water. Of course that’s just me, and I’m overly sensitive to salty foods. OMG- that looks so yummy! Pork intimidates me too- but I have some fat chops in my freezer… I need the courage!!! I’m going to start moving all those posts over to BAH starting in January and eventually take Exit 51 down for good. Jessica, this recipe could be step one in conquering your fear of pork. Just make sure you use an instant read thermometer to check the temp. What I’ve learned is that pork tenderloins are much less intimidating to work with than huge hams. I am NOT intimidated by pork. Trust me, this goody will make an appearance in thes cow town kitchen very soon! Perhaps christmas dinner. the inlaws will have a fit of apoplexy! Be kind to the inlaws on Christmas. Maybe make this for New Year’s instead? Thanks Karine. I think this would pair very nicely with the Apple Custard Cake on your blog.